Empty vials for injection play a key part in the restructuring of peptide products – you’ll need to buy sterile vials as a safe means of storing your products for future administration. At Valkyrie, we believe in providing you with the safest supplementary items for your cycle in conjunction with only the most premium quality anabolic produce to ensure that every cycle you run goes smoothly and effectively. At Valkyrie, we don’t simply offer high quality anabolic steroids; we offer the cream of the crop in regards to everything from therapeutic cycle support to the raw pharmaceutical grade materials necessary to safely deliver your chosen compounds. A 10 ml sterile vial purchased from us is going to represent the highest standards in terms of manufacturing and optimum sterility; this is one of the many reasons why the medical industry actually turn to us as a supplier on a daily basis. We operate around a strict code of ethics that includes batch testing every product line we distribute and ensuring that our engineering processes fall in line with the Good Manufacturing Practice guidelines – where we haven’t produced an item in-house, we’ll always ensure that the item we supply has been created in the exact same fashion by a trusted supplier. These elements are why we feature such an extensive array of positive reviews on our website; we’re well renowned for our emphasis on safety and value, and our customers know that our quality simply can’t be beaten. Sterile empty vials might not be the first element you consider when it comes to taking anabolic items; most people will be thinking about which products to take to achieve their goals, which products to combine them with and what to take as supplementary material in order to guarantee optimum vitality amidst use. Realistically though, if you’re a peptide user then 10 ml sterile vials and bacteriostatic water should be the first two items on your shopping list – they are literally going to serve as the vessel that safely carries your HGH derivatives into your body. Consider this; if you don’t buy sterile empty vials or the aforementioned water, you’re going to be playing a game of Russian roulette. Without them, you’d be relying on a vial that’d been handed to you by a friend or even worse one that came from a supplier without any supportive evidence in regards to its internal sterility. Equally, if you simply opted to utilise standard water or “alleged” bacteriostatic water from elsewhere; our safety standards would likely not have been in place during the manufacturing process. This could lead to you juggling with your life – should the water or vial be contaminated, then there’s no telling what adverse issues you may face when using reconstituted peptides. Being that peptides arrive in powdered form and must be “melted” using water for injection use before being stored at 20 degrees in a sterile vial – it probably goes without saying that neither the water or vial can be open to any sort of contamination. Not using these items would necessitate you not using peptides at all – these elements of their delivery really are that serious. 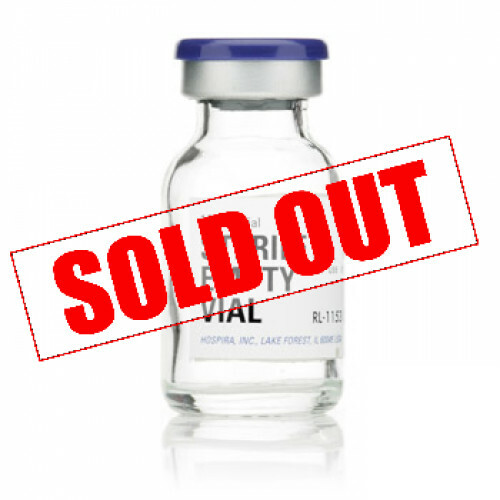 Buying sterile empty vials is luckily incredibly easy, and the two minutes it’ll take to secure them is nothing compared to the benefit they’ll offer you over the course of your HGH secretagogue utilisation. Simply search for this item by name using the search function on the homepage; you’ll find a wealth of sterile vials for sale in the subsequent results. Once you have selected the relevant sterile vial option, you simply need to process payment, following which your item will be discreetly delivered within the time frame specified in the FAQ section.